Are you gifted when it comes to cooking and preparing all types of dishes? 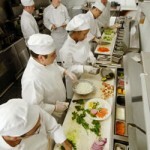 If yes, then it’s important to hone your craft by enrolling in the best chef schools you can ever find. If you do not have any options in your area or country, then going after some culinary arts schools abroad might be a better idea. Here are some things you to consider when looking for schools abroad. Curriculum. One of the first things you need to take into account when it comes to choosing a culinary arts school is the kind of curriculum they are offering. Are you looking at a two-year or four-year program? What are some information that you’ve gathered about the school, its graduates and everything related to it? Since you are opting to study abroad to become a good chef, all these things are important and should be considered. Tuition Fee. Another thing you need to consider is the tuition fee you will be required to pay. Let’s assume that you will be getting into the school as a normal student and not as a scholar so then you would have to pay for all your expenses. Make sure to compare the prices for tuition fees in other equally competitive schools and make sure too that the tuition school required by your school of choice fits your budget. Training. 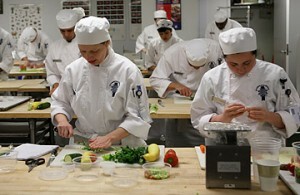 It is also important to look into the kind of training chef schools can give to you. What kind of equipment and cooking tools will you be using? Where will you be trained? Where will you have your on the job training etc. All these things need to be accounted for to make sure that you are in the right school and the right location. Location. Location is also another important thing to consider. If you are coming from a tropical country and you’re looking into a school that is located in a country that has four seasons, it might be difficult for you to adjust to this kind of weather. Other than this, you also have to take into account the location that you can afford. If you will be studying for four years, will you be able to afford it in your choice of location? Career Opportunities. Last but not the least you also have to have some ideas when it comes to possible career opportunities you can have after graduation. Some schools can give you an assurance for employment as long as you’re qualified and as long as you’re up to par with their standards. Now that you have more than enough tips that you can use when choosing chef schools abroad, make sure to take note of the importance of each and every one of them. When you do, you will find that they can reward you in more ways than one, particularly in helping you become the best chef that you can be.